Thoughts on knitting, yarn and life in general. This time of year is traditionally a time to reflect on the past year and look ahead to the new. Alba Yarns celebrated five years of business in France in July 2012 (I set it up in Scotland in April 2006 before we moved.) in recent years it has become easier to set up in France with the advent of the Auto entrepreneur scheme, but when I arrived in 2007, I could speak very little French and certainly not to business standard. We now look back and laugh about our first encounter with French bureaucracy at the Chamber of Commerce in Libourne. First of all it took us an age to find the office and we arrived just in time but somewhat hot and bothered. We thought we were reasonably well prepared and went carrying passports and copies of accounts from Scotland. Yes, they were needed and duly copied. Mme Etineau, who always had a very tidy desk and was immaculately coiffed, dressed and manicured then asked me for a copy of my marriage certificate dated within three months. But we’ve been married for more than thirty years, I said. Gallic shrug. I tried again. She wrote it down and with that we were dismissed. I ordered a copy of the marriage certificate from the GRO in Edinburgh, and then of course needed another appointment. At this point making phone calls struck terror in me, but somehow I managed it. And off we went again clutching the new marriage certificate. All went smoothly this time, Mme E filled in all the forms, we parted with 100+€, and I had a business officially registered in France. In the early days, the cost of cotisations (social security) was unbelievable, we had to subsidise the business heavily. Last year I was able to transfer to the new simplified system of payment – Auto entrepreneur, which is much better, as it is a percentage of turnover. Over the last six or so years I have sent orders to most counties in the world, but the top three are currently France, UK and USA. I also have customers who call to collect orders or browse the stock by appointment. I started a ‘knit and natter’ group, which started with great gusto, but tailed off to two or three of us. Maybe it was not the right time? Recently, one or two people have asked if I could teach them to knit, and knitting holidays seem to be really popular. I may look at both of these ideas for future years. I am proud that I have been able to turn a hobby into a successful small but global business that enabled me to follow my dream to live in France. 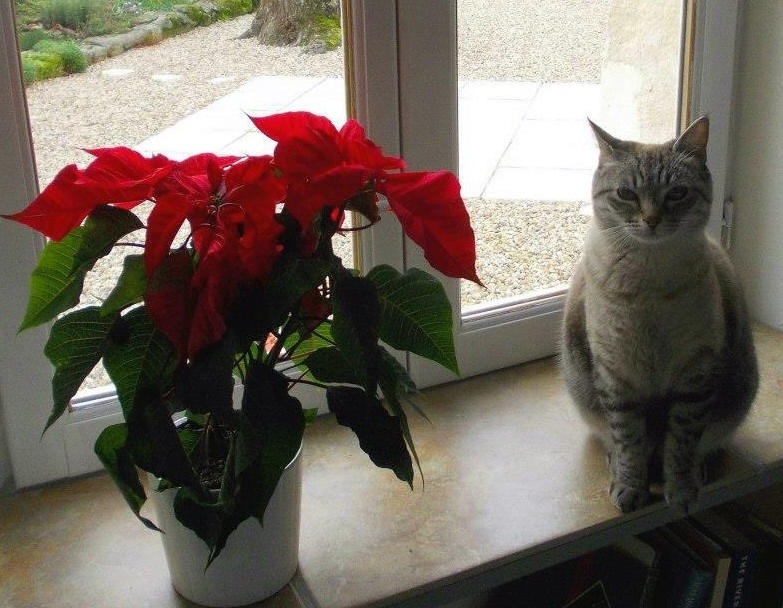 This week’s seasonal photo is of my little helper, Fleur in her favourite window. New Year resolutions, or not…. First Christmas market of the season. 8 & 9 December at Pineuilh. Cant play, no french, no problem!